Most people love sea otters. But many of us also love clams, crab, and other shellfish too. On the next Outdoor Explorer, we’ll talk about otters and try to understand how they may have changed the coastal ecosystem. We’ll also meet a tribal leader in Sitka who is doing something about it, with a sea otter hunt that also provides furs for Native handicrafts, which seems to be bringing back shellfish. Segment 1: “Sea otter biology and conservation”. 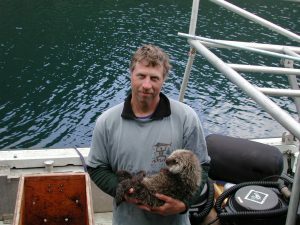 Daniel Monson, Research Wildlife Biologist at USGS Alaska Science Center. Segment 2: “Sitka tribal members harvesting otters”. Mike Miller, Sitka Tribal Council. Segment 3: “Training calendar part 6”. Lisa Keller, Multi-sport Training of Alaska.